Cars, Houses, Human Remains: Debris From Japan Is Headed Toward U.S. : The Two-Way The March 11 tsunami washed a huge amount of debris out into the Pacific. Scientists say it will circulate around the ocean, with some washing up on shores for years to come. This U.S. Navy photo shows, from above, debris in the coastal waters off Japan on March 13. Tires and parts of buildings are among the things floating. The stories keep coming about what could be some grisly and disturbing discoveries along the coasts of Hawaii and the western U.S. for the next several years. Last week, The Associated Press wrote about how scientists expect that over the next one to three years "wind and ocean currents eventually will push some of the massive debris from Japan's tsunami and earthquake onto the shores of the U.S. West Coast." 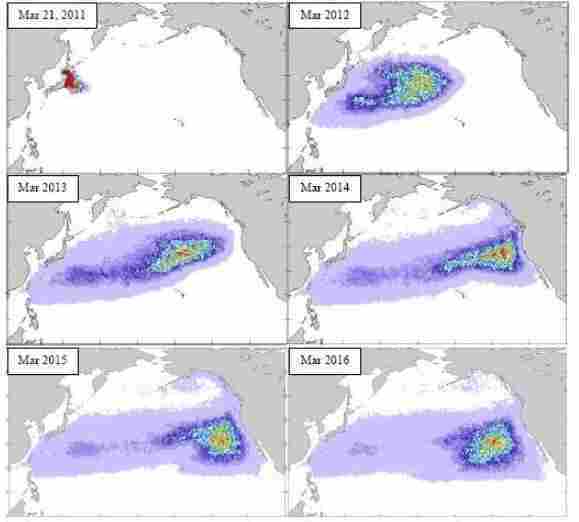 "In three years, the [debris] plume will reach the U.S. West Coast, dumping debris on Californian beaches and the beaches of British Columbia, Alaska, and Baja California. 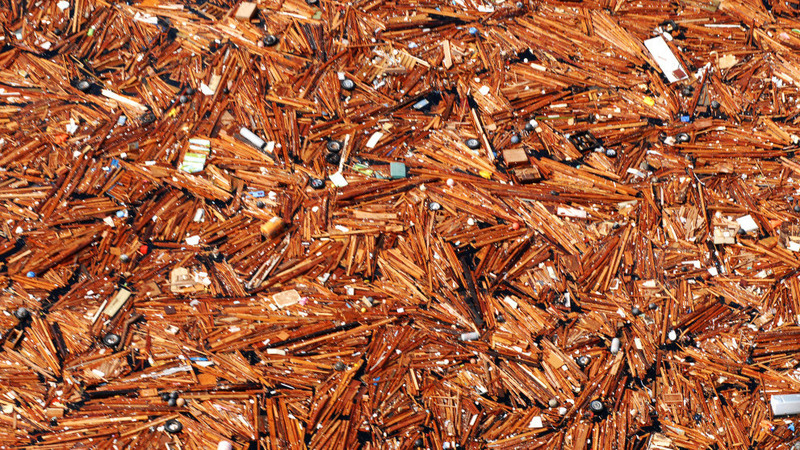 The debris will then drift into the famous North Pacific Garbage Patch, where it will wander around and break into smaller and smaller pieces. In five years, Hawaii shores can expect to see another barrage of debris that is stronger and longer lastingthan the first one. Much of the debris leaving the North Pacific Garbage Patch ends up on Hawaii's reefs and beaches." The research center has an animated graphic showing the debris field's likely route posted online here. And it has images of how the debris field will circulate, from this month (in upper left corner) to March 2016 (lower right). The projected path of the debris field, from March of this year (in upper left), through March 2016 (lower right). That's the Pacific Ocean, with Japan to the left and the west coast of the U.S. to the right. Hawaii is the small chain of islands in the center. Then today, there's this headline from the U.K.'s Daily Mail: "Cars, whole houses and even severed feet in shoes: The vast field of debris from Japan earthquake and tsunami that's floating towards U.S. West Coast."